“Geezer Bandit” Chalks Up #15 in Calif.
That rascally bandit known as the “Geezer Bandit” continues his elusive ways. On Wednesday, the FBI issued a statement that the bandit, who appears to be in his 70s, had hit his 15th bank in the San Diego area on Sept. 30, the Associated Press reported. The robbery occured at a Wells Fargo bank inside a Vons grocery store in La Jolla, Calif., AP reported. 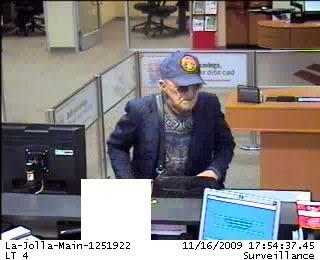 AP reported that the bandit approached the teller counter, pointed a revolver pistol at the teller and demanded money. The Geezer Bandit began is robbing ways in 2009. A $20,000 reward has been offered for information leading to the robber’s arrest and conviction. Some have speculated that the Geezer Bandit may actually be wearing a very-well crafted Hollywood quality mask to make it look as if he’s a senior citizen. Posted: 11/10/11 at 10:01 AM under FBI, News Story.